, an ancient Greek tragic poet, was born at Athens in the 71st olympiad, about 500 B. C. His | father Sopbilus, of whose condition nothing certain can be collected, educated him in all the politer accomplishments: he learned music and dancing of Lamprus, as Athenaeus says; and had jEschylus for his master in poetry. 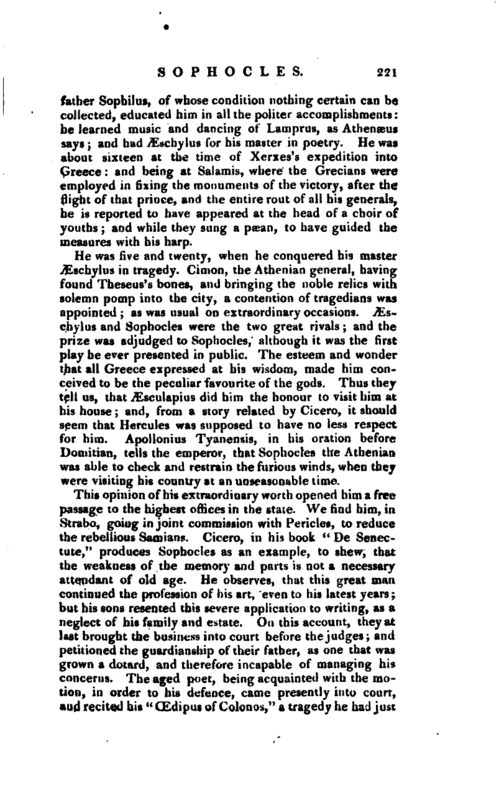 He was about sixteen at the time of Xerxes’s expedition into Greece: and being at Salamis, where the Grecians were employed in fixing the monuments of the victory, after the flight of that prince, and the entire rout of;11 his generals, he is reported to have appeared at the head of a choir of youths. ; and while they sung a pa,>an, to have guided the measures with his harp. He was five and twenty, when he conquered his master Æschylus in tragedy. Cimon, vhe Athenian general, having found Theseus’s bones, and bringing the noble relics with solemn pomp into the city, a contention of tragedians was appointed; as was usual on extraordinary occasions, JEschylus and Sophocles were the two great rivals; and the prize was adjudged to Sophocles, although it was the first play he ever presented in public. The esteem and wonder that all Greece expressed at his wisdom, made him conceived to be the peculiar favourite of the gods. Thus they tell us, that Æsculapius did him the honour to visit him at his house; and, from a story related by Cicero, it should seem that Hercules was supposed to have no less respect for him. Apollonius Tyanensis, in his oration before Domitian, tells the emperor, that Sophocles the Athenian was able to check and restrain the furious winds, when they were visiting his country at an unseasonable time. 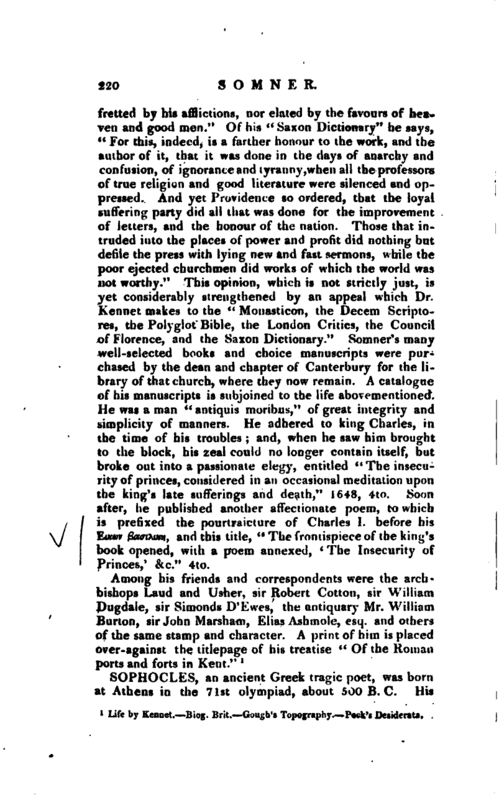 This opinion of his extraordinary worth opened him a free passage to the highest offices in the state. We find him, in Strabo, going in joint commission with Pericles, to reduce the rebellious Samians. Cicero, in his book “De Senectute,” produces Sophocles as an example, to shew, that the weakness of the memory and parts is not a necessary attendant of old age. He observes, that this great man continued the profession of his art, even to his latest years; but his sons resented this severe application to writing, as a neglect of his family and estate. On this account, they at last brought the business into court before the judges; and petitioned the guardianship of their father, as one that was grown a dotard, and therefore incapable of managing his concerns. The aged poet, being acquainted with the motion, in order to his defence, came presently into court, and recited his “CEdipusof Colonoaj” a tragedy he had just | before finished; and then desired to know, whether that piece looked like the work of a dotard? There needed no other plea in his favour; for the judges, admiring and applauding his wit, not only acquitte’d him of the charge, but, as Lucian adds, voted his sons madmen for accusing him. The general story of his death is, that, having exhibited his last play, and obtained the prize, he fell into such a transport of joy, as carried him off; though Lucian differs from the common report, and affirms him to have been choaked by a grape-stone, like Anacreon. He died at Athens in his 90th year, as some say; in his 95th, according toothers, B. C. 405. If JEschylus be styled, as he usually has been, the father, Sophocles will certainly demand the title of the master of tragedy; since what the former brought into the world, the other reduced to a more regular form. Diogenes Laertius, when he would give us the highest idea of the advances Plato made in philosophy, compares them to the improvements of Sophocles in tragedy. The chief reason of Aristotle’s giving him the preference to Euripides was, his allowing the chorus an interest in the main action, so as to make every thing to conduce regularly to the main design; whereas we often meet in Euripides with a rambling song of the chorus, entirely independent of the main business of the play. Aristotle, indeed, has given Euripides the epithet of T^ayixuralog, but it is easy to discover, that he can mean only the most pathetic; whereas, on the whole, he gives Sophocles the precedency, at least in the most noble perfections of ceconomy, manners, and style. Dionysius Halicarnassensis, in his “Art of Rhetoric,” commends Sophocles for preserving the dignity of his persons and characters; whereas Euripides, says he, did not so much consult the truth of his manners, as their conformity to common life. 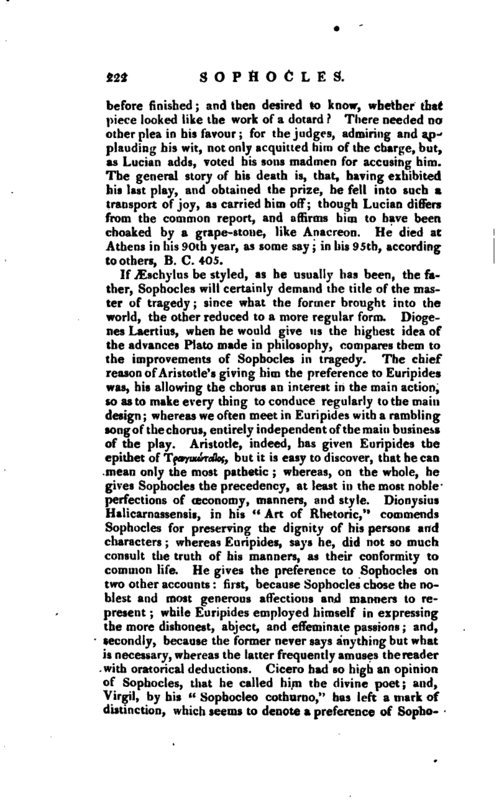 He gives the preference to Sophocles on two other accounts: first, because Sophocles chose the noblest and most generous affections and manners to represent; while Euripides employed himself in expressing the more dishonest, abject, and effeminate passions; and, secondly, because the former never says anything but what is necessary, whereas the latter frequently amuses the reader with oratorical deductions. 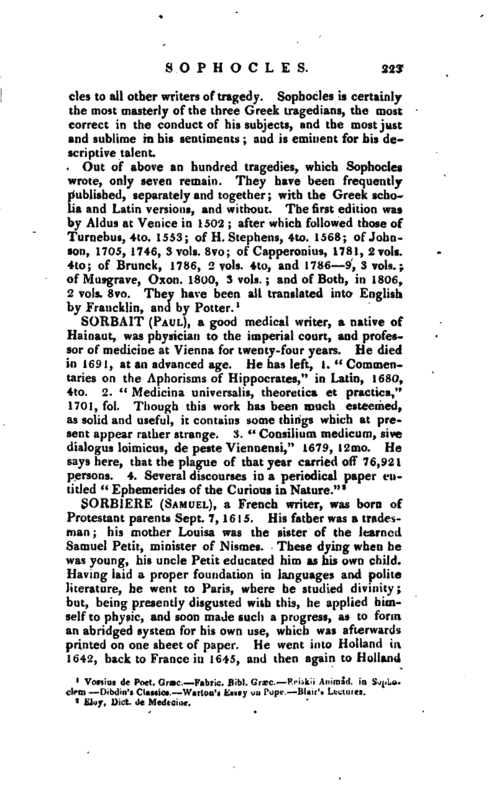 Cicero had so high an opinion of Sophocles, that he called him the divine poet; and, Virgil, by his “Sophocleo cothurno,” has left a mark of distinction, which seems to denote a preference of | Sophocles to all other writers of tragedy. Sophocles is certainly the most masterly of the three Greek tragedians, the most correct in the conduct of his subjects, and the most just and sublime in his sentiments; and is eminent for his descriptive talent. Vossius de Poet. Græc. Fabric. Bibl. Grace. Reiskii Animad. in Sophoclem. Dibdin’s Classics. Warlon’s Essay on iope. Blair’s Lectures.